The new fiscal year began on a strong note with an improved showing by the manufacturing sector in April as several automobile companies reported robust sales for the month, backing up the economic-revival narrative. The measure had dropped to a five month low in March. The economy is forecast to grow around 7.4% in the current fiscal, up from an estimated 6.6% in FY18. Numbers released on Tuesday showed strong sales by most car manufacturers, with the country’s biggest, Maruti Suzuki, reporting a 14.4% rise in April sales from a year ago. 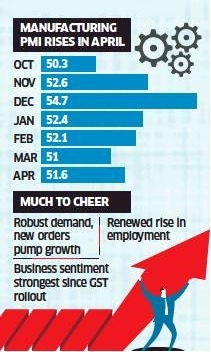 The PMI survey showed that improvement in demand conditions and rising production resulted in marginal growth in job creation last month. This was evident in intermediate and investment market groups. Driven by expectations of an improvement in demand, business sentiment was at the strongest since the implementation of the GST in July 2017. Monthly GST collections crossed ₹1 lakh crore for first time in April, indicating that the indirect tax regime was stabilising and that economic revival was picking up pace. The survey noted that the optimism of respondents reflected expectations that new business and demand conditions will improve over the coming 12 months. Consumer goods were again the bright spot, with output growth being the fastest among all the three market groups. Investment goods were the weakest-performing category as both production and new orders declined in April. Inflationary pressures moderated for the second month in a row, with the softest increases for input costs and output charges reported since September 2017 and July 2017, respectively, the survey said.